The prestigious West Point military academy has banned annual mass pillow fights among cadets marking the end of summer training, officials say. A recent event at the end of August left at least 30 soldiers injured. At least 24 cadets were reported to have been left unconscious because pillows were stuffed with hard objects. West Point Superintendent Lt. Gen. Robert L. Caslen said the academy was pursuing unspecified disciplinary measures against those involved in the fights. He was quoted in the New York Times as saying that those facing such measures included “senior military members and cadets alike”. Gen. Robert L. Caslen was not reported to have identified or provided the ranks of those who may be punished, but said he was determined “to send a clear message that this kind of behavior will not be tolerated”. An army investigation dated the pillow fights to 2001, but congressional testimony reported in the New York Times suggests they date back more than a century. One cadet suffered a broken nose in the August pillow fight, while others had dislocated shoulders. West Point academy argued at the time the fight was designed to build “esprit de corps”. None of the injuries was severe and all cadets have returned to duty, it said. 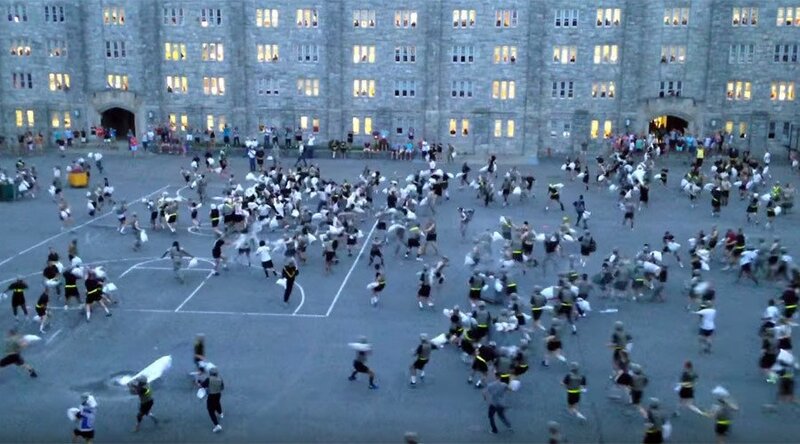 Video of the fight posted online shows crowds of yelling cadets, some wearing body armor as well as helmets, surging together in a central quad. The annual night-time event has been described as a harmless way of blowing off steam at the end of a grueling summer of training. However,this year’s event seems to have been a little over-exuberant, with pillow cases reported to have been stuffed with hard objects, thought to have been helmets. A report into the incident cited by the New York Times said that the injuries were largely caused by cadets being struck by “elbows or other body parts” or from being knocked down.